An evening of new plays directed by our 2018-2019 Directing Fellows. The cast includes Ellie MacPherson (54 Below), Gail Shalan (Bristol Old Vic), and Gus Cuddy (Geva Theatre Center) with returning Pie, Pint, and a Play actors Rachel Griesinger (Naked Angels) and Jessica Giannone (Bristol Old Vic, Williamstown, SPACE on Ryder Farm). The reading and pie will be located upstairs, so purchase your pint first then head on up! Doors will open 10 minutes before and are located towards the back. 61 Local (61 Bergen St.) is located steps away from the BERGEN stop on the F/G train. It is a 5 minute walk from the BOROUGH HALL stop on the 4/5 train and the HOYT-SCHERMERHORN stop on the A/C train. 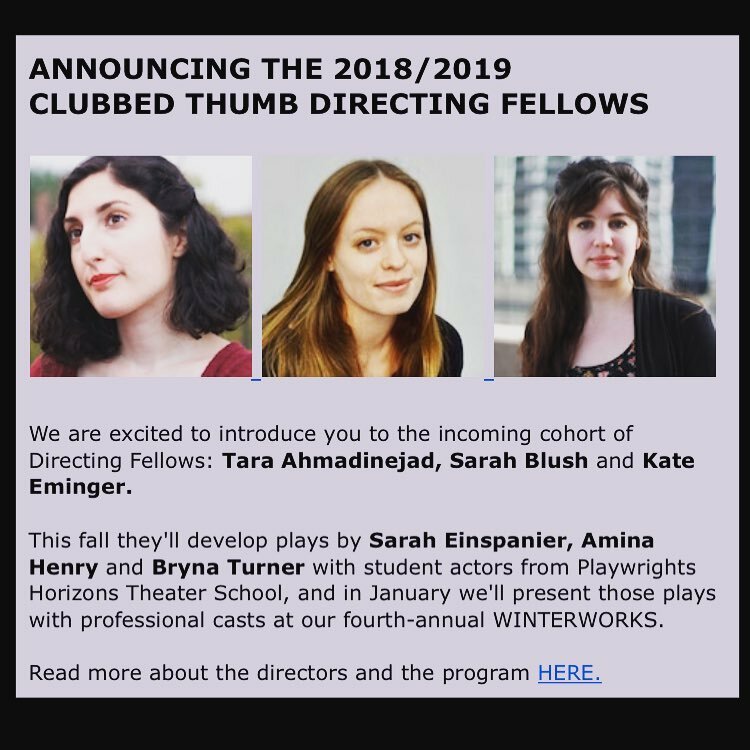 Next up I'll be a Directing Fellow with Clubbed Thumb, developing Bryna Turner's Rats! with the Playwrights Horizons Theater School. Stay tuned for the January showing as a part of WINTERWORKS. To read more about the program click here. About The Climb: Marge is a photographer, and her wife Tiffany has been her sole photographic subject for seven years. When Tiffany goes on a month-long hiking trip to get away from it all, both women are forced to question everything from their professional and personal past to the true meaning of a moment captured in time. A cast of misfit students have grown up idealizing the battle of The Alamo and spent their afternoons in History Club re-enacting the heroics of Davy Crockett against the evil attacks of Mexico's army and General Santa Anna. You, the audience, are invited to their fundraiser talent show to help them raise money for a field trip to their favorite historical site. It’s a fast paced and comedic exploration of the American penchant for mythical history, and the disillusionment that occurs when you realize that your history books have been wrong all along.